Castle Panic: The Wizard’s Tower – Now With 50% More Panic! Overview: Ok, yeah, I totally made up the 50% — maybe it’s 40%, maybe it’s 75%, but it’s definitely more. The Wizard’s Tower is an expansion to the excellent cooperative family game Castle Panic that adds a wizard to your side, allowing you to cast powerful spells … but the monsters are back with reinforcements, making them nastier and harder to kill. Although you can still play with your kids, The Wizard’s Tower ratchets up the difficulty level a bit, making it even more exciting for older kids and adults. Note: this is not a complete stand-alone game! You must have the original in order to play. 6 Mega Boss monsters, each with new, devastating abilities. Rating: Fantastic extension of a great idea. Who Will Like It? Fans of the original Castle Panic will love the additional features, particularly older players who thought it was too easy to win. Highly recommended to anyone who likes the idea of fighting off encroaching hordes of monsters — and if you don’t like cooperative games, there are some variant rules that allow a bit more competition. Three walls down, and the Wizard's Tower is on fire. Stand together! The castle has been rebuilt since the last wave of monsters, and you’ve managed to recruit a Wizard to your side. As long as his tower survives, he’ll help you by casting powerful spells, doing massive damage to monsters or even allowing you to rebuild towers. Of course, now there are bigger monsters as well, with a host of new strategies: flying monsters, flaming boulders, and swarms of Imps. The new cards and new monsters are pretty well-balanced, but the heightened dangers really do add just a bit more anxiety as you see all the monsters piling up. You really do feel set upon from all sides, and everyone breathes a sigh of relief when a monster is eliminated before it reaches the walls. Castle Panic does a great job of making the theme fit the gameplay. A few of the new wizard cards available. The Wizard’s tower (seen in the photo above) replaces one of the regular towers during setup. 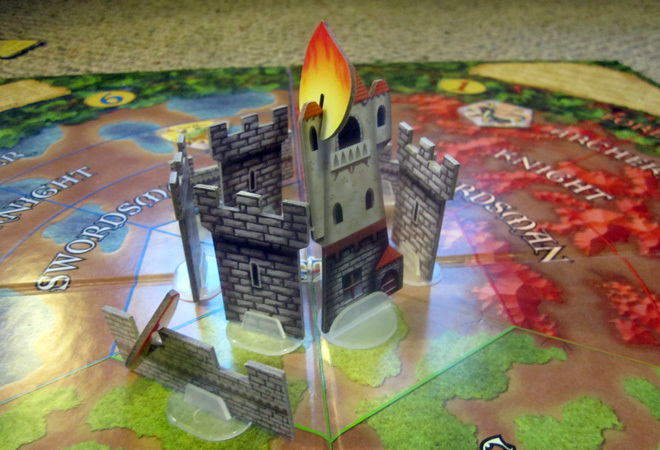 The flame tokens are also cardboard, with a notch cut out of them, and can be attached to walls, towers, and even monsters. The Castle cards get mixed in with the original cards and have the same backs. However, I noticed that they are just a wee bit wider than the originals, which means they stick out when you shuffle the cards. The Monster bag is a black velvety sort of fabric, with the Castle Panic monster face on the side. It’s a great touch, because now you can just dump all the tokens in and pull them out of the bag, rather than having to turn them all face-down on the table. 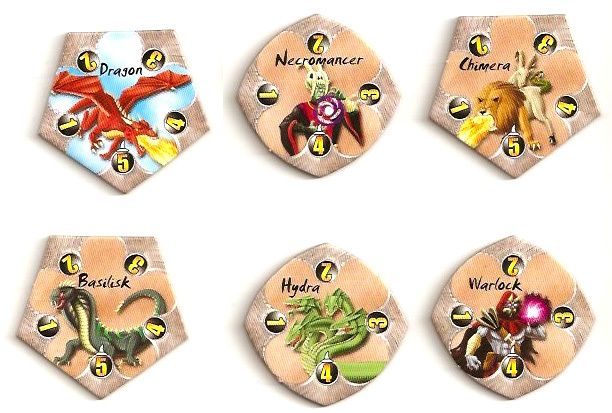 All of the monster tokens are the same size and shape as the original tokens, except for the 6 Mega Boss monsters (more on those later). There are 6 Harbinger tokens for the Mega Boss monsters, which aren’t triangular. The Harbingers are the same size and shape as the regular tokens, but just have the name of the boss printed on them. It’s a clever way to mix in the more powerful monsters without being able to pick them out by feel. Finally, all of the cards and tokens from the new set have a little wizard’s hat icon on them, making them easy to separate out if you want to play the original game. The whole thing comes in a long rectangular box, about half the size of the original, but all of the new components will fit in the original box. The Imps come in swarms; the Conjurer brings Imps with him, the Doppelganger becomes the next monster killed. For the basic rules of Castle Panic, check out my earlier review. I’ll just focus on some of the new things here. The basic setup is the same, but one of the towers is replaced with the Wizard’s tower. Some of the monster tokens from the original game are removed and set aside. The Imps go in a pile by the board, as do the 6 Mega Boss monsters and their Harbingers. All the other tokens are put into the bag. As before, six monsters are placed in the archer rings around the castle, one in each arc. Then, the Harbingers are shuffled; three are put into the bag and three are set aside (without looking), so you don’t know which three Mega Boss monsters will come during the game. The Wizard deck is shuffled separately from the Castle deck. The phases of the game are the same as before, with one exception: during the discard-and-draw phase, you may draw your replacement card from the Wizard deck instead of the Castle deck if you choose, as long as the Wizard’s tower is still standing. Once the Wizard’s tower is destroyed, players may no longer draw cards from that deck, although they can still play cards they have in their hand. Some of the cards have a tree icon on them, meaning that they can actually affect monsters in the Forest, which was previously unreachable. The monsters have picked up new weapons, and some can fly. There are flying monsters, which can only be hit by archers and heroes, regardless of what ring they are in. Boulders don’t crush them when they pass. The monsters have also picked up some new weapons: the Flaming Boulder knocks down the first castle piece it encounters, and then sets the next piece on fire. The Trebuchet destroys the first castle piece it encounters, and also kills any flying monsters in its path. Fire can affect both your castle and the monsters. When monsters are on fire, they take one point of damage at the end of each turn after moving. If any of your structures accumulate three flame tokens, they are destroyed — but you can pay one Brick or one Mortar card to remove a flame. There are also some Wizard cards that can help extinguish fires. Burning structures will not damage monsters when they are hit (since they’re already weakened), but they do catch the monsters on fire. The Goblin Cavalry moves faster; the Ogre is strong; the Climbing Troll skips over walls. The new Castle cards are pretty interesting, too — most are used in combination with other cards. For instance, you can use Flaming with any hit card to add fire to the monster hit. There are cards that let you change the color or range of a hit card, or the Double Strike, which lets you play a card twice. There are a lot of new monsters (19, not counting the Imps and the Mega Boss Monsters), each with their own abilities — and, in some cases, weaknesses. For instance, the Centaur cannot be hurt in the Archer ring at all, but is instantly killed if it is hit in the Knight ring. The Goblin Cavalry moves two rings at a time instead of just one. Imps are easy to kill, with only one hit point, but they tend to come in large packs. I won’t list all of them here, but you can check out a PDF of the rules here. The Golem, the Centaur, and the Cyclops each have a special weakness and an immune zone. Finally, there are the new Mega Boss monsters, the scariest of them all. Chimera: moves 1 space counter-clockwise, 1 space closer to the castle, and then breathes fire. Dragon: moves in various directions (including backward) based on a die roll, then breathes fire. Hydra: each time you hit it, you add 2 Imps to the Forest ring in its arc. Necromancer: adds 2 monsters from the discard pile back into the bag, plus some more if he attacks a structure. Basilisk: forces everyone to discard down to 2 cards when it arrives, plus prevents you from the Discard-and-Draw phase. Warlock: everyone must discard a Wizard card when he arrives, is immune to Wizard cards, and teleports around the board. Finally there are additional rules for playing with the Monster Overlord variation, and some more suggestions for adjusting the difficulty level of the game. My kids and I have been fans of Castle Panic , but we did find that on the default setting we usually won without too much difficulty, depending on when some of the boss monsters and effects showed up. The Wizard’s Tower really mixes things up significantly, with some truly powerful monsters and some very effective spells. There are also added elements of strategy, because you really want to protect the Wizard’s Tower if possible, and it’s no longer most effective to simply attack whatever monster is closest to the castle. At times, you have to work on killing off a Mega Boss monster even if it means letting some of the smaller monsters into the castle. Although the age range on The Wizard’s Tower has been increased to 12 and up (the original was 10 and up), I think it’s still something that could be played with younger kids, as long as the older kids and adults can explain the new monsters and cards to them. The one thing about this version is that you’ll probably need to refer to the rulebook or reference cards the first few times you play, looking up each new monster as it appears, since each one may have some special feature. The game is still largely luck-based: you draw new monsters at random, you roll a die to see where they show up, and you can’t trade that many cards per turn. The additional Castle cards are a little hit-or-miss, since most of them are dependent on having a good hand of cards to combine them with. However, it still makes for a fun cooperative game and you can feel the tension building as the monsters really start piling up. I really like The Wizard’s Tower , particularly because I think it makes it work even better for older kids and adults. There’s more excitement when you draw a monster token simply because there are so many different possibilities. If you enjoyed Castle Panic , this is a great way to add some fresh challenges to it! For more about the game, visit the Fireside Games website. Wired: More monsters, more powers, more panic! Monster bag is a nice touch. Tired: New Castle cards are slightly oversized. The game can still feel largely luck-based.